Agroforestry – the practice of growing trees on farms – provides a living for one sixth of humanity, and nearly all of us use and consume some of its goods and services. Ever-increasing numbers of farmers are planting trees to increase soil fertility and crop yields, restore degraded soils, sequester carbon and reduce erosion. Trees on farms provide a wide range of goods: from cash crops like coffee to vitamin-rich fruits; from animal fodder to fuelwood; from resins to medicines. For millions of people, agroforestry provides a significant source of income and a pathway to prosperity. Trees for Life tells their story. It takes the reader on a journey from the home gardens in Borneo to the well-wooded cattle pastures of Nicaragua; from the sand-swept parklands of Niger to the cocoa gardens of West Africa; from the palmeries of Amazonia to dairy farms that cling to the flanks of Africa’s Rift Valley. 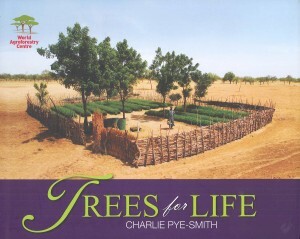 Trees for Life was launched at the 3rd World Agroforestry Congress, which was held in Delhi in February 2014. It draws heavily on the ‘Trees For Change’ booklets which feature elsewhere on this website. Much of the credit, both for the book and the booklets, must go to current and past Directors General of the World Agroforestry Centre, Tony Simons and Dennis Garrity, and to the communications director, Paul Stapleton.